NOTE: An ongoing radiation storm has overwhelmed solar wind sensors onboard NASA's ACE spacecraft. Solar wind readings reported above are temporarily unreliable. Photo details: Dec. 13, 2006, 0350 UT; Coronado SolarMax40, Stellarvue 80. As a result of the blast, a radiation storm is underway. Based on the energy and number of solar protons streaming past Earth, NOAA ranks the storm as category S2: satellites may experience some glitches and reboots, but astronauts are in no danger. 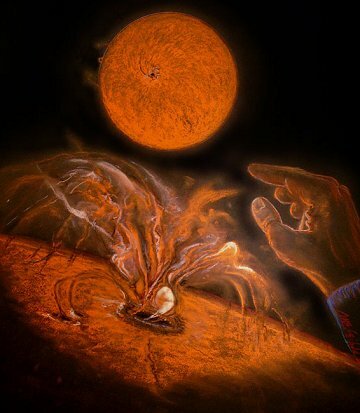 Magnetic fields and hot plasma emerging from the sunspot's dark core reminded Seibold of "anatomical forms being born from a black pool. It conjures up William Herschel's assertion that 'the sun is richly stored with inhabitants.'" Clearly, the sun's not just a star--it's a muse. Solar activity is surging, so grab your pastels.